When you live with a maniac, it's important to find outlets to relieve your stress. When I'm not defending myself against incoming threats, I find a good scratching is just what the psychiatrist ordered. Bonus: All this scratching allows me to keep my claws in tip-top shape. After all, I never know when I might really need them... what with trouble always lurking behind me. Katie, we think you've got a good plan for relieving stress! Is the Stress Stopper working? Feliway? Be sure to keep quiet once all the fireworks start. Katie you really shouldn´t lock Waffles up like that !! That's what my human does with Binga when I am eating! I have my human nicely trained in that area. We're surprised your posts aren't shredded by now! Have a great week! We can't help but feel a little sorry for Waffles. Hee hee. Beautiful Katie!!! He's behind you!!! LOL!! 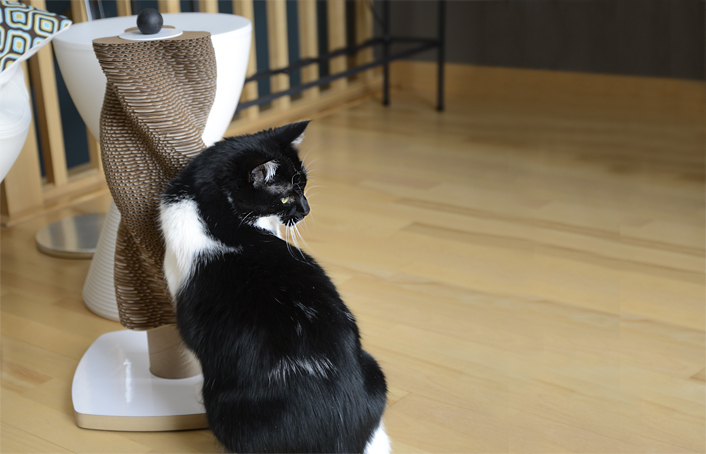 Awww what a wonderful scratcher! p.s. sweet Waffles Too - we hope you are out now! LOL! Haha! 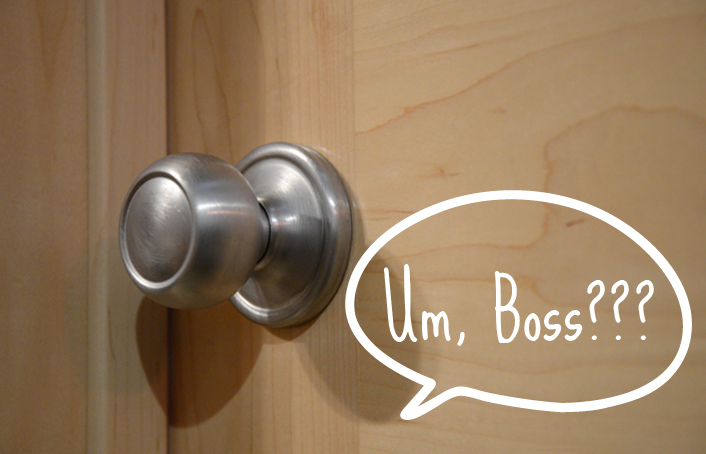 We think there's some stress behind that door! ha, ha, ha Katie....maybe Waffles should keep that citrus helmet on for a while! Hehe! Have a nice week sweeties! Hey Katie, what's behind door No. 1??? Katie, you're one smart girl! I laughed out loud when I saw the door and door handle. Beautiful too. Katie you are brillant just brillant I tell you! LOL a good way to relieve stress Katie. Hi! 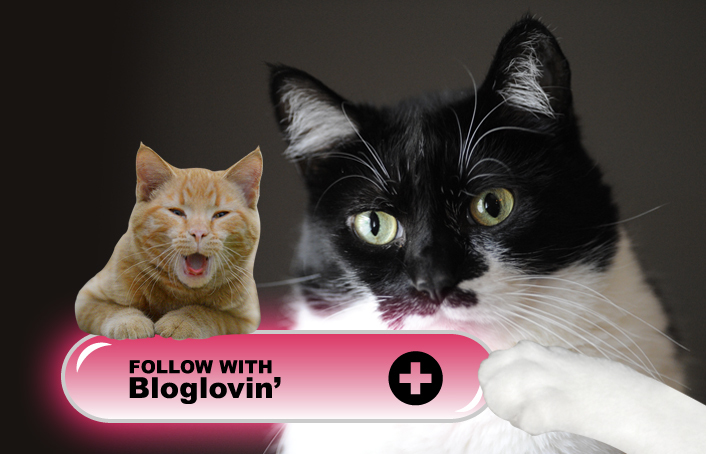 Mommy signed us up for Bloglovin" and I think she likes it. THANK YOU, THANK YOU, THANK YOU. No more whining at our house! Well, no wine either. 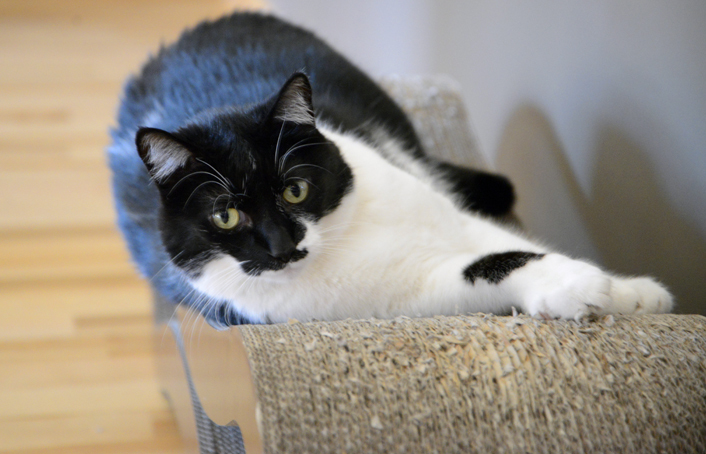 Wow, Katie, you sure have some fancy-lookin' loungers and scratch posts/stress relievers! I like a good scratchin' session, too. Who am I kidding? I LOVE THEM! Gotta ask... that second picture... is that an art nouveau scratchin' post? I LOVE IT! sure, but don't forget, when Cod closes a door, He also opens a cat flap, so you may want to be prepared for that as well. Good lucks, Miz K.
Gasp, you scratch on cardboard, Katie? Good job locking W2 in a room. I gotta look up to you that you haven't killed him … yet. Ooooooh! Ahhhhhh! Happy July 4th!!! The AmazeCats Cards Are Here!